Latest Bonus: Up to 125% Bonus! Is it possible to make money with Expert Option? Is Expert Option a scam? In the review we’re going to perform a full scam check in order to check is it safe for online traders. During our checks we go through pros and cons, bonus offers, regulation, account types, withdrawals and more. Stick around if you want to know more before engaging with the broker. Our goal is to provide you with reliable information from a third party reviewer. As Binary365 is a trader community, make sure you leave your review or comment if you have any experience with the broker. Deposit Options Major credit cards, e-payments and bank transfers. Regulated. The most important check that should be on the list is regulation. Expert Option is currently regulated by FMRRC. Free demo account. Anyone who’s interested in binary options trading can set up a free demo account, which is going to be deposited with $10,000 virtual money. Low minimum deposit. In order to begin trading in the real account, traders are required to invest at least the minimum deposit of $50. High returns. One of the leading brokers when it comes to profitability. Expert Option profits from successful deals can reach even 95%. Deal execution. Deal execution is instant. Most brokers process deals in few seconds, with Expert Option there are no delays. It’s very important features when trading short term binary options. Rich education materials. You’re new to trading or an expert, most likely you’ll find something useful on the website. Videos, pictures, graphs, ebooks and more. These materials are free of charge. Most popular deposit options. The platform accepts the most popular payment options, i.e. bank wire, credit cards, debit cards, Qiwi wallet, Skrill, Neteller, Yandex Money, WebMoney and more. Rich bonuses. There are multiple account types, which also means different bonuses. Bonus offers are usually from 50% up to 125% if you invest more than $2,500. Relatively new. The platform was launched in 2014; however, there’s already a lot of information from platform traders. USA traders restricted. Traders from the United States of America are not accepted. No Range and One Touch options. The broker only offers standard binary option trading deals (either short or long). The broker is very active when it comes to bonus offer. Get the latest bonus from Expert Option below. Bonuses may reach even 125% from your initial deposit. Based on what we’ve seen, we believe that Expert Option platform is one of the best in the market. It has very valuable features and it also has a social aspect where you can follow expert trades. The most important features are covered and it’s very modern. Short – standard binary option deals that are less than 5 minutes short. Long – standard binary option deals that are longer than few minutes. Demo – there’s no registration required to test the platform. Just click on the demo button and you’re good to go. Mini – the minimum deposit required to begin trading in real money account is $50. It’s a little bit more than lowest available options in the market but it’s the most popular amount that traders choose when beginning trading in a real money account. Silver – if you decide to invest $250, you’ll get a Silver account. With the account you’ll also receive a personal manager and a bonus of 80%. Gold – starting from $1,000 traders can apply for a Gold account. Faster withdrawals, better bonuses (100%), increased asset profit and more. These are only few great features that come with the account. VIP – the best account available on the platform. In order to qualify for a VIP account, you’ll need to invest at least $2,500, however, it may be worth if you consider trading seriously. The broker offers a 125% bonus on your initial deposit, Individual trading history analysis, increased asset profit, a personal manager and other useful features. How to get Expert Option demo account? 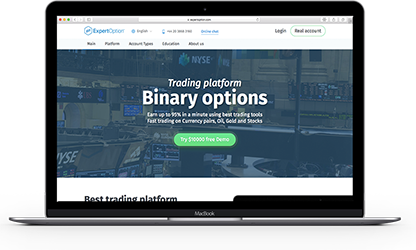 Expert option offers a free demo account and it’s as simple as clicking on a demo button. No registration required to try the platform. Once you enter the platform you’ll see that you have $10,000 in your demo account to play around. Use it to get familiar with the platform features. If you prefer to trade on the go then there’s good news from the broker side. All most popular mobile platforms are supported and you can download the app free of charge from the respective app depository. We’ve identified that a third party financial institution FMRRC is regulating the broker. Based on the fact mentioned above there’s no reason to believe that the broker is a scam. Based on the Internet Archive information the broker first appeared online in 2013, however, it started to actively market the service quite recently. Withdrawals are available from as low as $10. The following methods are supported by the platform: Visa, MasterCard, Maestro, UnionPay, Skrill, Neteller, Payweb, PerfectMoney, Qiwi, Yandex.Money and Webmoney. Once on the platform, traders can select a Signal option. The list of multiple assets appear and on the list traders can see how strong is a signal for each trade and in which direction a price may go. 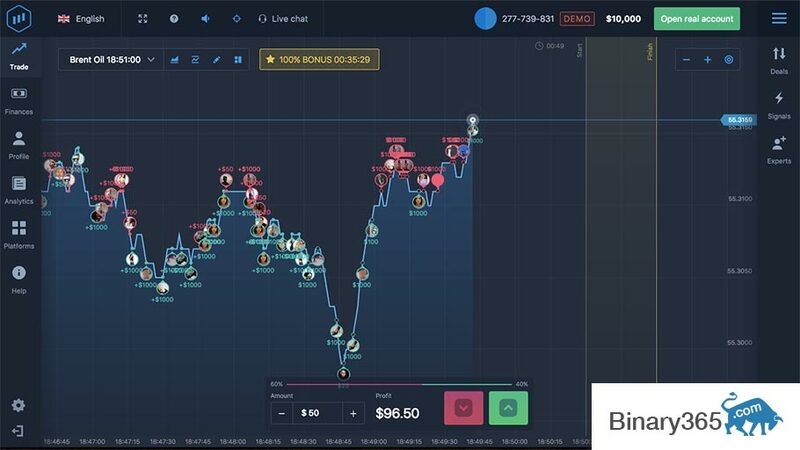 This feature is loved by many traders and it’s definitely a good help from a side if you don’t have a lot of experience in the trading field.